If you’ve had a wine from Montenegro, then most likely it was from Plantaže. Started as a huge “Agrokombinat” nearly half a century ago, they claim that their Ćemosko vineyard is the largest in all of Europe. With 11 million grape vines growing on 2,310 hectares of land, picturing the size of this is like imagining nearly half of Manhattan planted with grape vines! During their harvest, they employ over 2,000 people which, in a country with a population of just over 600,000 makes them a huge employer. In addition to Vranac and Krstač (both native Montenegrin varietals), they also plant and bottle Cabernet Sauvignon, Merlot, Chardonnay, and a whole slew of others in minor amounts that are both tank and barrel-aged. Naturally, all of this would beg the question as to whether the wines are actually any good given the tremendous scale upon which they’re made. Like many former cooperatives in former Yugoslavia, they make a very high-end line that’s typically difficult to get a hold of. As it is, we’ve tried all the standard bottles that you’d find in the grocery stores of the area or from importers. Typically, the wines run rather dry with a strong acidity and pair very well with food. Mindblowing, they’re not, but at around $10-13 on the US market, they’re far better than most anything else in that price range. 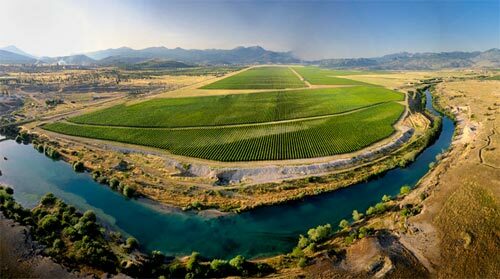 And, perhaps you’re wondering, “Are there other wineries in Montenegro?” There are actually and in future articles we’ll talk about them as they’re small producers that are difficult to find, even in their home country.